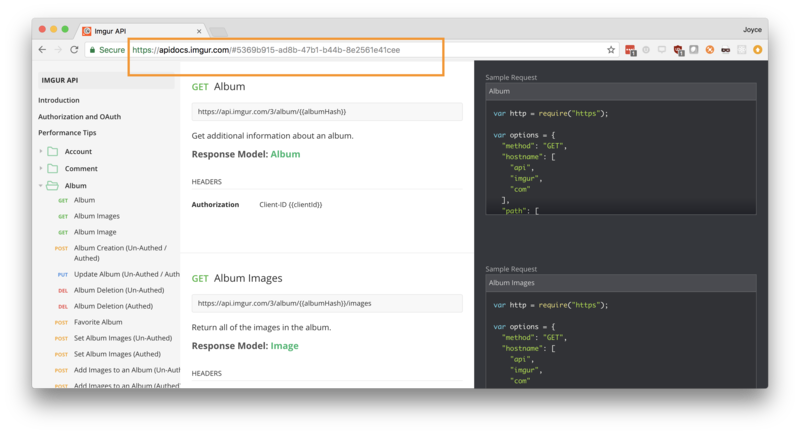 Postman's API Documentation feature lets you view private API documentation or share public API documentation in a beautifully formatted web page. 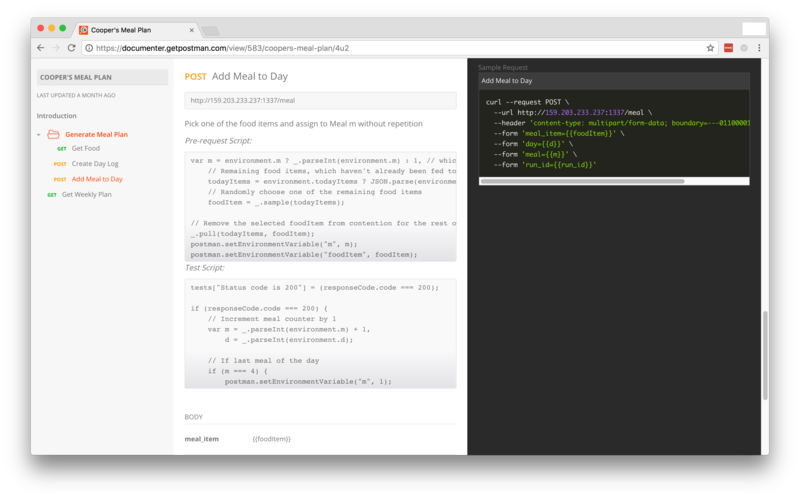 Postman generates and hosts browser-based API documentation for your collections automatically in real-time. Each collection has a private and public documentation view that Postman generates from synced data in the servers. To access the private view of your team documentation, go to the sidebar in the Postman app and click the > icon in the collection you want to view. Then click "View in web" to view the documentation for the collection. To access the private view of your team documentation, go to your workspaces dashboard. Click the "View all collections" link. Click a collection name to view the documentation. After you publish your documentation, you can use the public link to view the documentation. The public link displays after you publish your documentation. A link to this published documentation is also accessible in the "Published" dropdown from the private documentation view. Postman uses ordered requests and folders to organize documentation in sections to reflect the structure of your collection. You can customize descriptions using Markdown styling with embedded graphics to complement your documentation. Postman supports GitHub-flavored Markdown so you can include tables. When including block elements, make sure you leave an empty line before and after to avoid any rendering issues. The links are generated using IDs for the requests, folders and responses. If you click on any of these, the URL in your browser should update to a link which points to this specific part of the documentation. You can hyperlink to these parts using this link. Note: You cannot link to arbitrary parts of the documentation by manually creating an ID. You can post comments on your API documentation to share information with your colleagues. You can save interactions with your teammates, add information that does not fit anywhere else, and can have discussions and more. 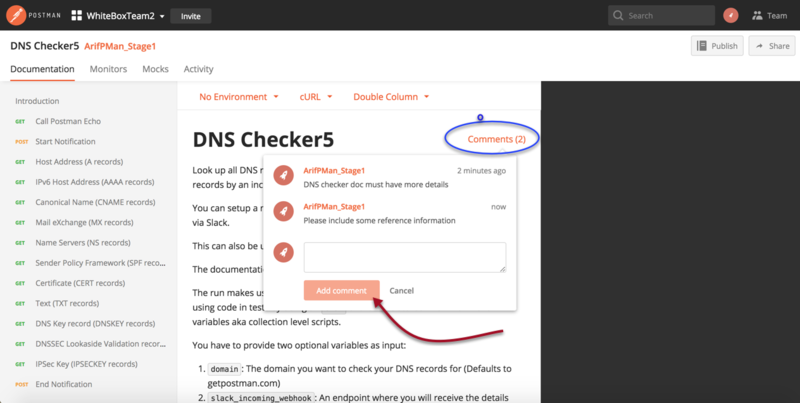 You can post comments on your documentation by navigating to the documentation section from the Postman App. To learn more about accessing the documentation section, see viewing documentation. Click Comments to bring up the 'Add comment' dialog, as illustrated above. Write your comment and click 'Add comment'. Your comment is now posted. Note: You can post comments only on Private Documentation. Public and private documentation each receive 1000 free views per month. You can check your usage limits through the Postman API or the account usage page.